Now is the right time to make a summary of what I have done during my project. Multiple changes to sky image export feature: added the option to add legends to exported images (with the option to preview them before the export) and SVG file support. Added multiple types of legends, with scales, magnitudes chart, symbols list. A few changes to flags feature: correct support for locale-characteristic characters, the option to add/edit/delete flags directly from sky map via context menu and the ability to add flags without icon images (text-only). Apart from that, user can now edit flags after they are created. Multiple FOV export support: now it’s possible to export multiple field of view snapshots containing images of sky fragments inside area defined by active FOV symbol. Star hopper-based FOV export: this is experimental feature that needs tuning (mainly to the star hopper tool itself). It allows user to automatically capture field of view snapshots in a way convenient for star hopping. Logging forms containing basis fields embedded in finder charts. Details tables: general, position, rise/set/transit, asteroid/comet details. Finder charts that can contain logging forms, multiple field of view snapshots, details tables and notes. Added Printing Wizard that gathers all the stuff together, and enables user to customize their finder charts. Despite I’ve managed to complete all features listed in my proposal, I am sure that I’ll continue to work on KStars as I’ve came up with many new ideas during the work on my project. 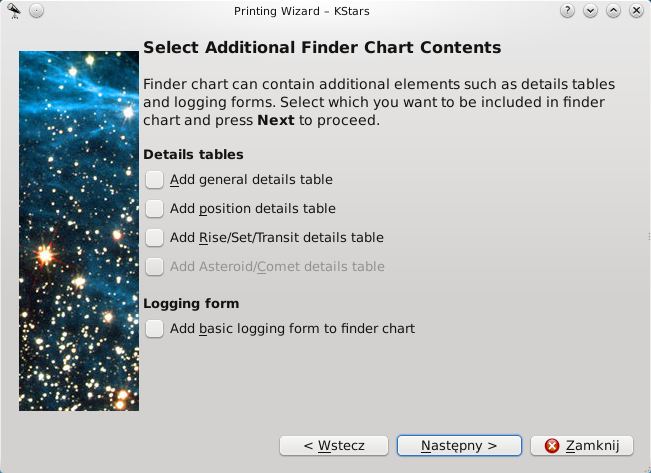 Here are a few screenshots from Printing Wizard, which let’s user to configure all the options related to printing finder charts with other goodies. Example finder chart, showing what can be included in finder charts: PDF / ODT. Three more weeks to go, and just a few things are left to do in my project, namely printing wizard and star hopper based FOVs export (the later is mostly done). During last three weeks I’ve managed to finish user-defined FOV representation export function, finder charts and logging forms (some minor TODOs are still left, but these are rather related to formatting & layout corrections). Now I am working on printing wizard, that will enable to access all of the new KStars printing features in a way (hopefully) convenient to user. I’ll put here a few printouts created with new printing features as soon as printing wizard is done (I plan to end it next week). It’s been quite a long time since my last post, but it certainly was fruitful – I passed my exams and work on my project has gained momentum. As for now, legends and annotations are done and integrated with KStars GUI (although there will be probably some changes to them in the near future). I am now finishing field-of-view export feature which is certainly one of the hardest parts of my project. After I am done with this, I intend to make a little sprint and put everything together to provide basic finder chart&logger form printing. Expect some more technical details&screenshots during the next weekend! The end of this week and beginning of the next is quite busy time for me (2 rather hard exams), so it’s unlikely that I’ll be able to work effectively on my project during this period. But after that, I plan to speed up a little bit and provide basic finder chart printing before the mid-term evaluation deadline (July 15). That would be considerably more than stated in my initial time-line. Good luck for everybody working on their GSoC projects! When I browsed through different finder charts almost every one of them contained simple logger form, containing at least fields for data such as observer name, date and time, observation site and telescope/eyepiece models. The example of such finder chart can be found here. 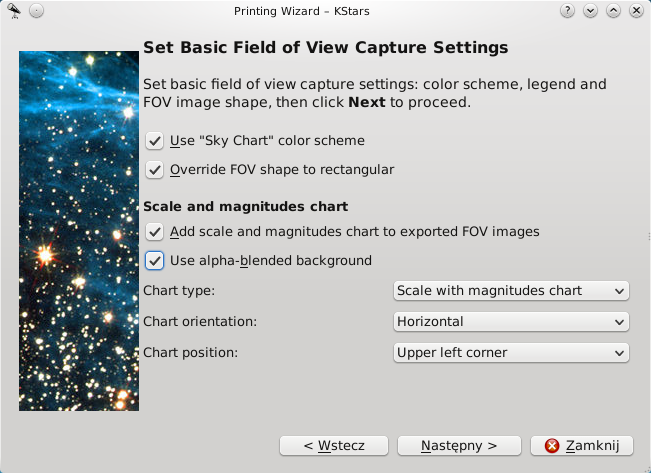 Currently KStars enable users to print rendered sky images by File->Print menu (the printouts are unfortunately broken, at least for me). I intend to leave this menu for printing simple rendered sky images with legends, but full access to added functionality will be by “Finder chart&logger form wizard” action in context menu. There will also be an option to invoke wizard for multiple sky objects, thus enabling print of multiple finder charts and logger forms with same settings but different objects. Options set in wizard will be quite basic – the position, orientation and color scheme (defined in KStars Options window) for legend, Field-Of-View configuration etc. Less frequently used configuration options will be available by using Options window of KStars. Should multiple fields-of-view be placed on single image or separately? Place each field-of-view representation on separate image – this has the obvious advantage of being really clear and also easier to implement; such option is used in finder charts available here. I will implement both of them, so everyone will have a chance to pick more convenient option. Besides, I am finishing the first part of work on finder chart legends – expect first screens in a few days. My GSoC project – Printing support for KStars – Let the coding begin! So, after almost a month of researching KStars code-base and writing simple mock-ups, it’s time to begin actual coding. The aim of my project is to provide full printing support for KStars, including finder charts and observation logger forms. As logger forms will use some of the code developed for finder charts, it’s an obvious decision to implement finder charts first. 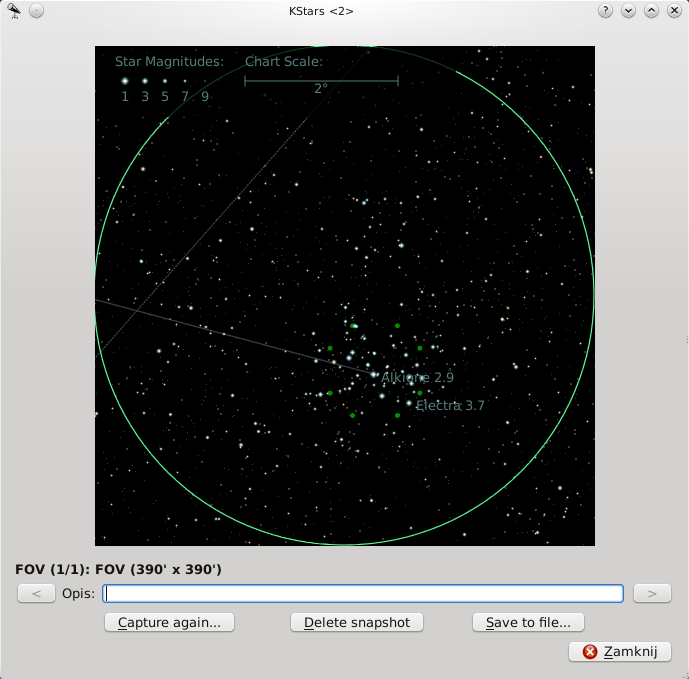 Finder charts, as the name suggest, are helpful for finding sky objects, particularly stars – mainly because they contain images of sky centered at the point of interest with different zoom levels, enabling you to quickly find the object you are looking for and begin the observation. Apart from multiple fields-of-view, finder charts should contain legend with star magnitudes and of course scale of the chart. There will also be an option to add customized annotations to the objects presented on the finder chart. The first task on my checklist is the implementation of customizable legends for finder charts – I will keep you updated with results, with some working finder chart examples in a few weeks. Good luck for everybody working on their GSoC and SoK projects! My project proposal (KStars: Printing support) for this year’s edition of Google Summer of Code has been accepted! Many thanks to everybody at KDE, KDE-Edu and KStars for giving me the opportunity to work on it. Special thanks go to my mentor – Victor Cărbune and Akarsh Simha for support and useful advice. The aim of my project is to extend functionality of KStars in terms of printing. Currently, KStars can print rendered images of the sky, but objects are not well-annotated, there is no possibility to include legend or user-defined comments. I will work to provide KStars project with aesthetically pleasing, fully customizable, yet easy to use finder charts with multiple fields-of-view. Second feature that will be added to KStars is printing logger forms. Much of the work that needs to be done to implement this functionality if quite similar to that in the first part of the project. The third part of my project – converting printed forms to OAL-compliant reports using OCR should be treated as optional – I doubt it can be reliably done within the time-frame of GSoC. To be completely fair and to avoid promising things I am not 100% sure I can handle, I haven’t mentioned it in my project proposal. After tinkering with a few Open Source OCR libraries, I am quite optimistic about this feature – even if it is not ready at the end of GSoC, I will finish it later, as I plan to still work for KStars after the summer. July 15 – Mid-term evaluations deadline – finder charts with legends, annotations and multiple FOVs will be finished. September 5 – September 11 – I will be available to answer any questions.